Goodrich School, a very brief history by Andy Doidge. Thomas Goodrich is probably the man that Goodrich Road was named after. A number of roads in East Dulwich are named after churchmen, e.g. Goodrich, Jennings, Heber, Underhill, Thompson and Silvester. He was born at East Kirkby in Lincolnshire, the younger son of Edward Goodrich. His year of birth is not known, but must have been just before 1500 as he was living in Cambridge, with his brother, in 1510 and began his MA in 1514. He was a tutor at Cambridge University and in 1529-30 he was on the committee that assessed the legality of Henry VIII's marriage to Catherine of Aragon (his brother's widow) which resulted in their divorce. He then became a chaplain to Henry and on 19th of April 1534 he was made Bishop of Ely with the Archbishop of Canterbury conducting the ceremony in Croydon. After Henry's death he became a privy councillor to Edward VI and was one of the scholars who helped to compile the Church of England's first book of common prayer. On Edward's death he was imprisoned as a traitor as his association with the Duke of Northumberland had implicated him in the attempt to put Lady Jane Grey on the throne. He was quickly released and continued as Bishop of Ely until his death, only nine months later, on 10th of May 1554. About the Goodrich school building. Goodrich School consists of three separate buildings - the Main Building, Lythgoe Building and Cather Building. Peter Cather and John Lythgoe were Chair and Vice-Chair of governors for many years and John Lythgoe in particular was instrumental in saving Goodrich school from closure. It was largely built in 1886 with the linking wing of the Cather Building built in 1894. A small "Raising Of The School Leaving Age" extension was added in the 1960s, now Nursery 1. The school was built on land that used to be Friern Manor Farm to a standard London schools board design. Unfortunately bombing during World War II destroyed the characteristic bell tower and dormer windows of the main building. The original school was for all children of statutory school age but following the 1944 education act the Main Building and what is now called the Cather Building became Friern Road Girls School and what is now the Lythgoe Building became Goodrich Infant School. This was a single form entry infant school, difficult to imagine in modern London. Junior age children transferred to Heber school. In the late 1960s the ILEA amalgamated Friern Road Girls School with Honor Oak Girls' Grammar School and created Waverley Girls School at Peckham Rye. The intention was to move the children of Goodrich Infants to Heber and, presumably, to dispose of the site. A campaign by governors and parents saved the school and the ILEA turned it into a full primary school and moved it to the main building. The Southwark Adult Education Service took over the vacated Lythgoe and Cather buildings as well as the attic rooms of the main building. 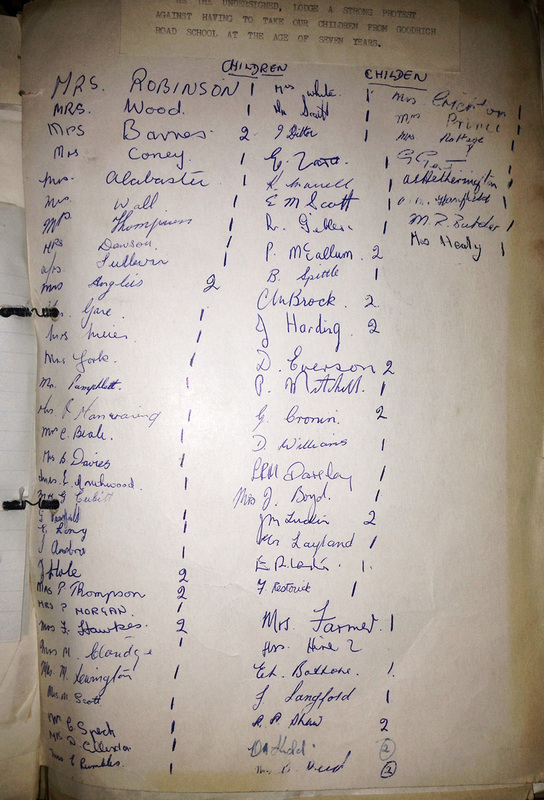 A page from the petition raised by parents in 1961, protesting against the proposed closure of the upper (KS2) school. From that point on, Goodrich continued to grow and by the early 1990s had reached 2.5 forms of entry, with one part-time nursery, and was bursting at the seams. In the summer of 1994, just as it ran out of classrooms for the September intake, the Adult Education Service was transferred to Southwark College, vacating the Lythgoe building, so Goodrich could take control of the entire site. Since 1994 the school has grown even larger and is now a three form entry school with two part-time nursery classes, a maximum of 630 full-time and 100 part-time children.